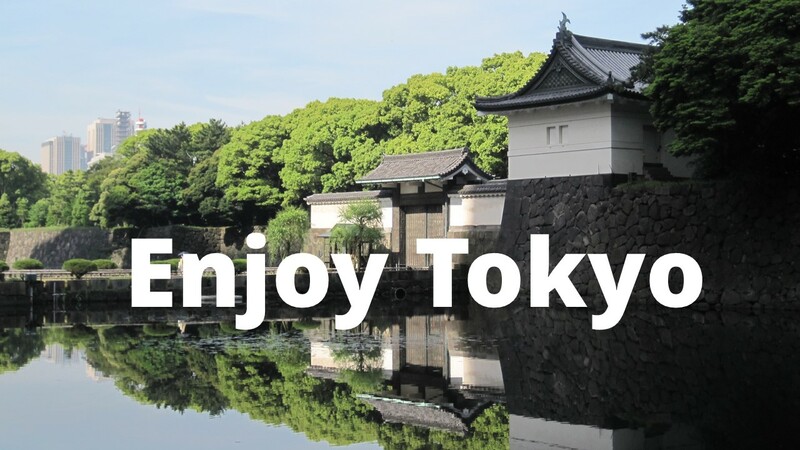 There are several sites famous among overseas travellers for “o-hanami” or cherry-blossom viewing in Tokyo. 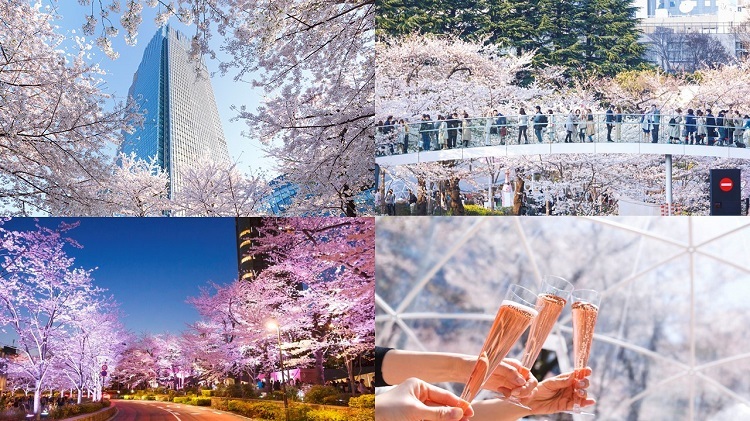 But apart from such over-crowded tourist spots, the city is plenty of places to offer colourful events, for free, to celebrate spring with cherry blossoms – Tokyo Midtown in Roppongi, for instance. Tokyo Midtown, near Roppongi intersection, is a large commercial and cultural complex, which constitutes a vertex of the “Roppongi Art Triangle”. 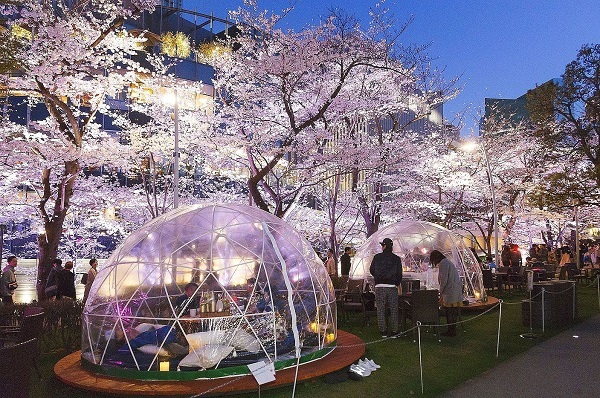 It is also a great spot for a contemporary way of o-hanami in the middle of Tokyo. 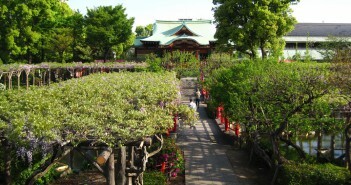 The outdoor space “Midpark” is connected seamlessly with Hinoki-cho Park (run by Tokyo’s Minato City), making a generous lush green plot for an area like Roppongi. 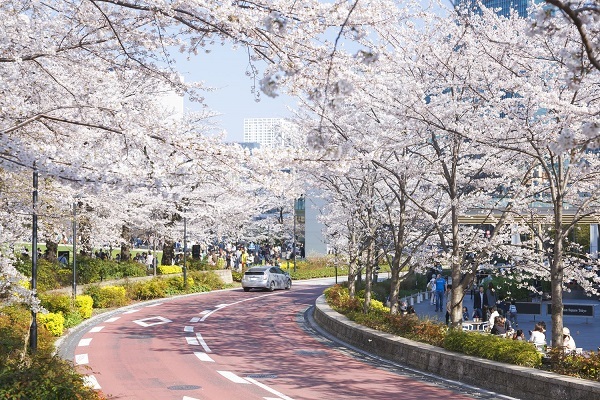 All together there are some 150 cherry trees of 8 species that burst into bloom every spring. 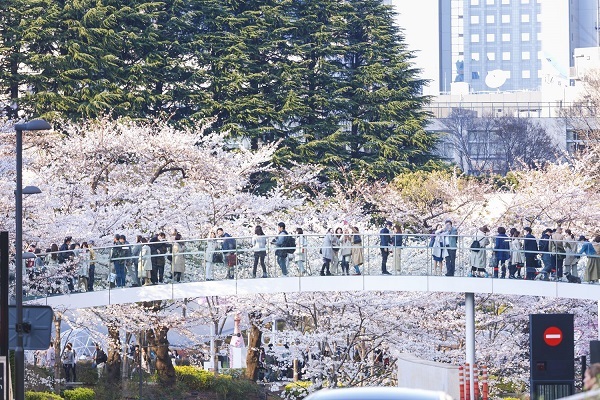 The sight of the blossoms is particularly pretty at Tokyo Midtown, along a stretch of 200 meters called “Sakura-dori” lined with somei- yoshino cherry trees. The blossoming season of this path usually falls around the end of March through the beginning of April. 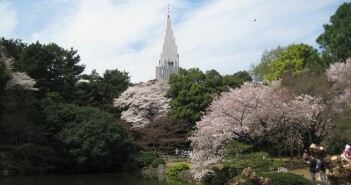 The annual spring celebration will take place in the garden and the buildings of Tokyo Midtown. 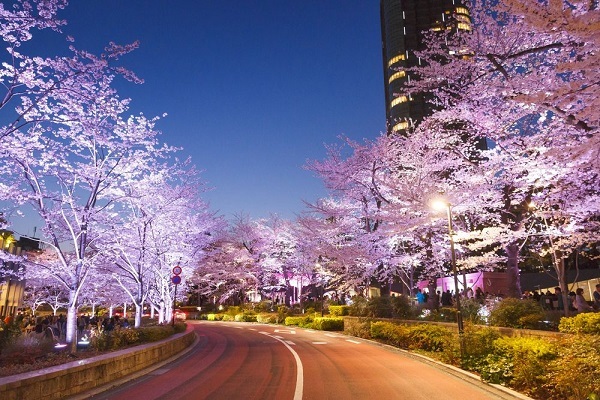 The cherry trees lining the stretch of Sakura-dori will be lit up in pink shades before the blossoming, and in white at the burst of flowers. 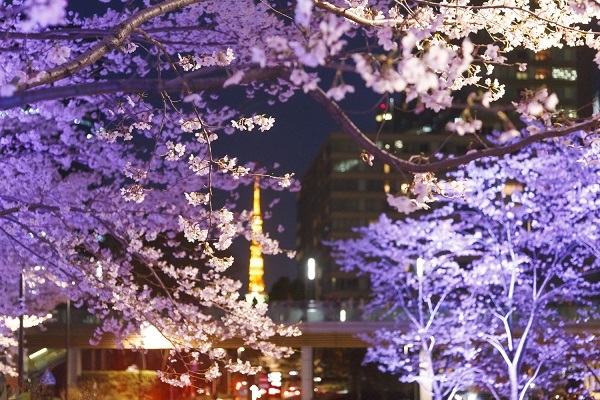 Some restaurants have a terrace facing the path, great for dinner with a fantastic view of the illuminated cherry trees. 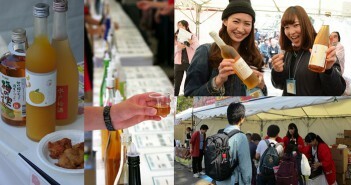 The pop-up “Lounge” in the garden is a popular event that offers an occasion of stylish urban “o-hanami”. 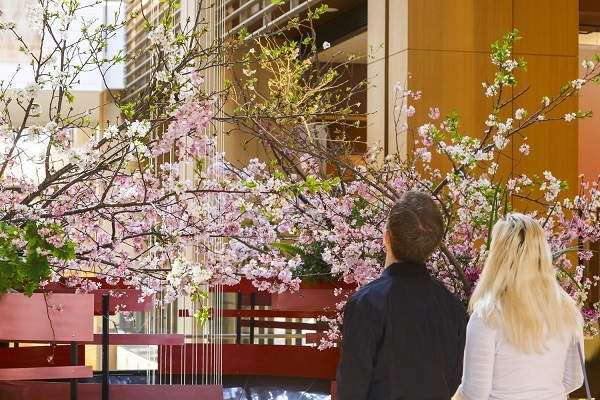 Sample delicious snacks and sweets confected in the theme of cherry blossom by the Ritz-Carlton Tokyo, under the direction of the sous chef William Khala. Perhaps with a glass of rose sparkling wine, to match the mood of spring. 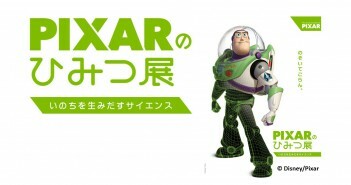 To celebrate the 12th anniversary of Tokyo Midtown, a glass of rose sparkling wine will be offered for free. 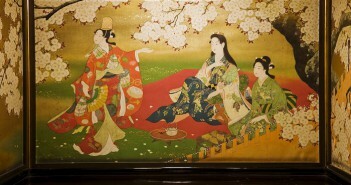 Showcases gorgeous spring flower art. 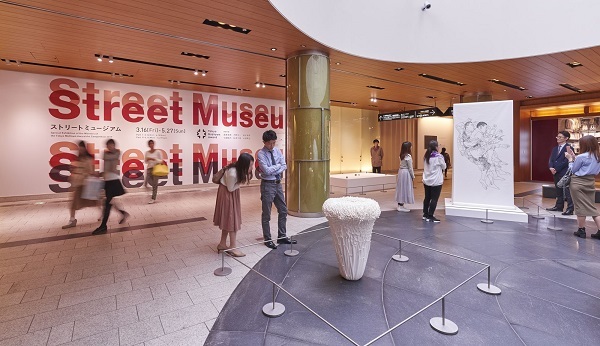 Street exhibition of latest works by 6 award winning artists of the Tokyo Midtown Award 2018.